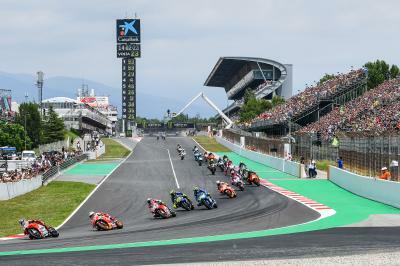 Ahead of the Gran Premi Monster Energy de Catalunya, reigning World Champion and Championship leader Marc Marquez (Repsol Honda Team) was joined by Valentino Rossi (Movistar Yamaha MotoGP), Andrea Dovizioso (Ducati Team), Danilo Petrucci (Alma Pramac Racing), Cal Crutchlow (LCR Honda Castrol), Joan Mir (EG 0,0 Marc VDS) and Mugello winner Jorge Lorenzo (Ducati Team). 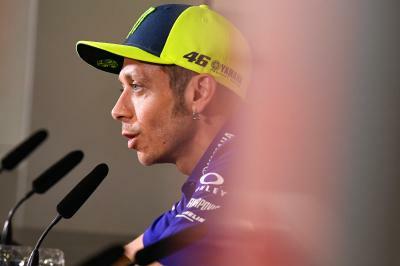 Talk went from last time out at Mugello to the weekend ahead in Montmeló, and also centered a lot on the moves made recently in the rider market. 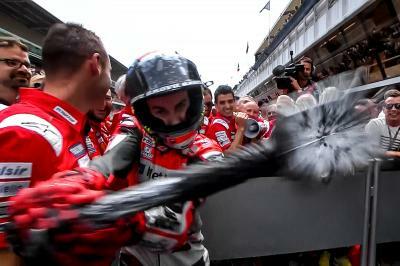 Next, talk moved to the biggest headline of the week: Jorge Lorenzo was confirmed at Repsol Honda from 2019. Marquez says it will be a big change – but that he’s happy he’s on the inside, not facing it down from the outside. Marquez also went back to that point, and reiterated that he’s eager to learn from the five-time World Champion who’ll be arriving next year. 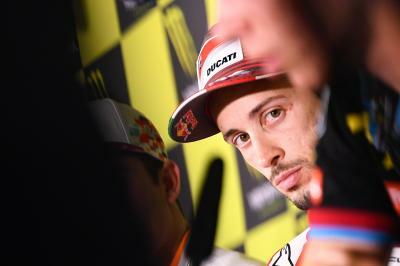 Then, of course, the rider from Tavullia was asked for his thoughts on former teammate Lorenzo’s move – echoing many voices in the paddock. The secret to keeping the best kept secret in the paddock? 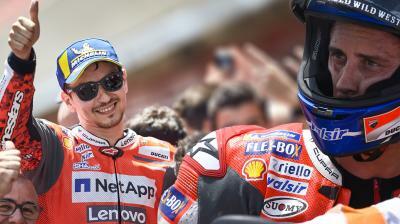 “Just don’t tell anyone,” laughs Lorenzo, “it’s easy!” The Mugello winner then went back to give a little insight as to how it came about. 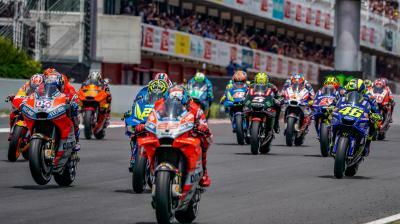 Can the Borgo Panigale factory win two in a row as they did in 2017? 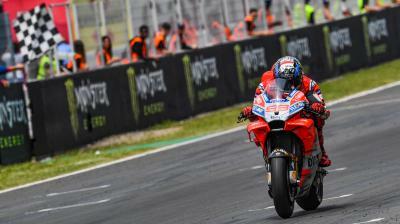 Last year it was Lorenzo’s teammate Andrea Dovizioso – and this year the Italian could equally be another threat for the victory. 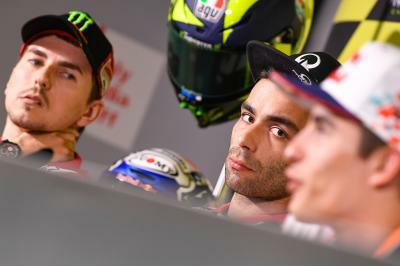 On to the man himself, Petrucci talked Mugello before then moving on to his career path that will now see him become a factory rider in 2019. Then, from STK1000 to factory MotoGP™ rider – it’s been a long road. 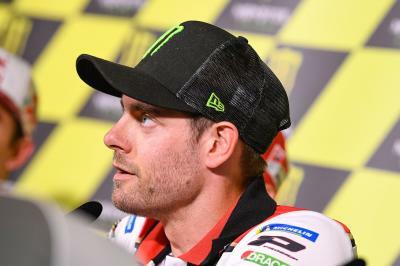 Then Argentina GP winner Cal Crutchlow took the mic, saying Mugello was a good step forward after some tougher races. Finally, Moto2™ rookie and reigning Moto3™ World Champion Joan Mir took to the spotlight, just a few days after an equally big announcement for him – a move to MotoGP™ next season with Team Suzuki Ecstar. The Catalan GP begins with Free Practice on Friday, before the race starts on Sunday at 14:00 (GMT +2). 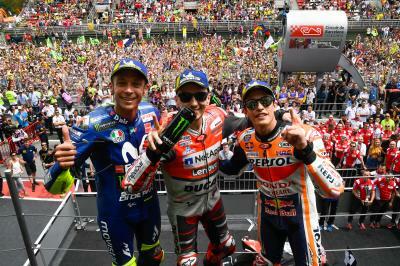 Lorenzo, Marquez and Rossi created history in Barcelona, but what are the figures behind one of the most successful rostrums in history? 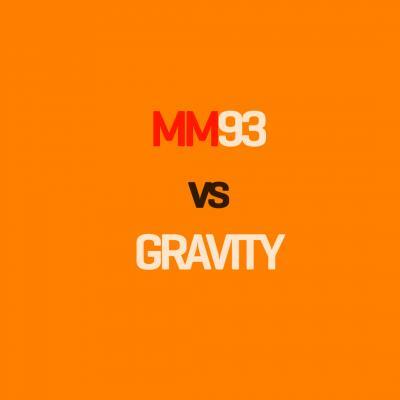 Another Grand Prix and another ridiculous Marc Márquez SAVE!